To answer my own questions – no, I cannot begin to lift it! And no, it will not control roaming cats! They will readily climb out. So, I hope you have found the answer by now. The word gabion is a derivative of a 16th century French (Italian, too) military term. I will describe it in light of Rochambeau and Washington’s preparation for the battle of Yorktown in the of fall 1781. 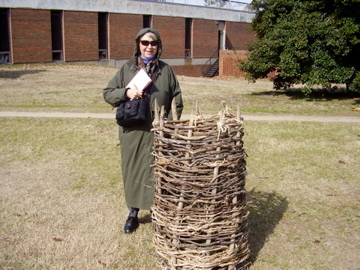 A gabion, when completed, resembles a tall cage made of strong, wooden sticks enveloped by interwoven vines much like a huge basket. This one beside me in the picture stood about 4 plus feet high. It is filled with stones and dirt, all compacted to make a tidy package that could be transported to the scene of an upcoming battleground. By the way, it takes one man a day to make one. N.B. The sappers and miners who performed most of this pre-siege drudge job at Yorktown worked all day and all night for several days in all kinds of weather under enemy fire. The army required countless gabions to perform the job they were created to do. You say, what good would this funny, super heavy, unwieldy thing do to aid in an attack or a defense of in a siege? Well, when the gab ion is put to work, it helps to form a part of the defensive redoubts that will protect the troops as they fire on the enemy. But this does not tell the whole story yet because, as it is, bullets and grapeshot will pierce it easily. So, after the gabions are handmade, and there will be many, many prepared in advance of the opening volley, they will be neatly buried in the long lines of earthworks. These gabions help to create and build up earthworks faster than using shovels full of dirt. When incorporated into the breastworks they will be invisible reinforcements of the same. Soldiers will then be able to fire their muskets from behind the raised mound of earth and be protected by them at the same time. 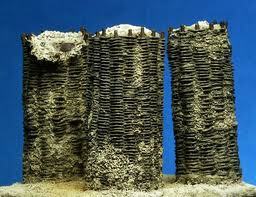 I welcome any additions, comments and corrections that might add to our knowledge of gabions!